The German soprano tells us about the role of Strauss's complex heroine. Angela Denoke must be a shape-shifter. How else could the elegant blonde woman sitting opposite me turn herself into a cold-blooded murderer, a psychotic woman or a damaged teenager desperate for love? And how does she shrug off the psychological scars at the end of a performance, along with the red wig or the bloodstained shift? "You don’t have to become these women, you just have to understand what they’re feeling," says Denoke stretching out her long, black-jeaned legs after a flight from Vienna. "I like to take on these roles – Katya Kabanova, Marie in Wozzeck, Katerina in Lady Macbeth of Mtsensk. They’re all passionate women who are fighting to survive. I can feel what they’re feeling." I’ve just heard Denoke sing her first Katerina at the Vienna State Opera. The part suits her so well, physically and vocally, that she might have been singing it all her life. The same is true of Strauss’s complex heroine Salome, which she returns to Covent Garden in May for a revival of David McVicar’s searing production. When Denoke slips on Salome’s simple white dress, it will be the fifth time she has appeared in this opera. "In each production I find a different side to her. I love to work with directors who ask a lot of me, and bring out new things. That’s what makes this profession so interesting." 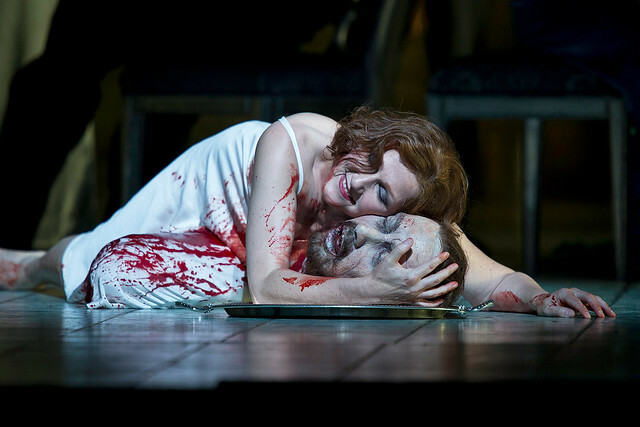 Angela Denoke made a short but memorable debut at the Royal Opera House in 2006 in Willy Decker’s production of Duke Bluebeard’s Castle and Erwartung. Her portrayal of the mysterious woman in Erwartung, alone in the dark with a dead body, impressed the exacting Guardian critic Andrew Clements. "Denoke… is the real vocal star of the evening. She sings Schoenberg’s cruelly taxing lines with total naturalness, belying the work’s reputation, while Petrenko creates teasing webs of sonority around her. It’s totally enthralling." Denoke enjoyed her brief experience of working at the Royal Opera House, and is delighted to be back this Season singing in Salome. She has her own theories about why Salome behaves the way she does – and it’s all about love. "She needs love and some real emotion, she just hasn’t had it in her life. When she meets Jokanaan she can feel there’s something special in this man, but she can’t get through to him. The things she does that work on other people just don’t work on him." Denoke thinks Salome doesn’t mean to be cruel when she asks for his head. "She wants to get his love. She wants him to really look at her for the first time." It’s no coincidence that Denoke is in demand to interpret the 20th century’s most difficult scores. As a child she was encouraged by an inspirational piano teacher and became an accomplished pianist. It wasn’t until she finished training as a music teacher at Hamburg’s University of Music and Theatre, in her mid-20s, that she decided to switch to the vocal course. "I’m very thankful for that training, because today I can sing any music straight off the score." Angela Denoke is also a versatile actress whose short blonde hair, high cheekbones, slim boyish figure and physical flexibility make her the ideal canvas for directors and costume designers. Even today, in her 40s, she can easily pass for a 20-year-old on stage. Straight after college she won a contract with the opera company in Ulm, and was thrust into an incredible variety of roles. "In my first year I sang Ninetta in Love for Three Oranges, The Merry Widow, the Countess in The Marriage of Figaro, a Wolfgang Rihm opera and Falstaff. They were big parts – the Rihm especially was big and difficult – but I loved it." Her voice was already mature; a lyric soprano, not huge but powerful, with an attractive combination of purity and warmth. Today she can take on punishing roles that require her to be on stage from beginning to end, and her stamina never seems to be in doubt. For Lady Macbeth of Mtsensk she had to open the opera singing a pianissimo phrase while lying fl at on her back on the floor. The effect was spine-tingling – the phrase was soft , pure and completely audible at the back of the house. Two and a half hours later, Denoke finished the opera with a simple folk-like lament – equally pure, equally audible, and totally controlled. How on earth does she do it? "I’m very strong. I use my whole body to produce the sound. It takes a long time to get this balance, but once it’s there, you can relax." It’s not all 20th-century angst in her repertory, though. She has sung the Marschallin in Der Rosenkavalier – "I was the youngest Marschallin ever to have sung at the Vienna State Opera." She feels very at home in Wagner, singing in Parsifal and Tannhäuser for Daniel Barenboim at the Staatsoper, Berlin, among other places. She says she hesitated before agreeing to sing Sieglinde at the Stuttgart Opera, but found it suited her very well. "It’s a soprano role, but there’s a lot in the middle of the voice. The middle of my voice is very strong, and I can sing lower parts too without pushing. I’m not a mezzo, but maybe I’m a lazy soprano!" Denoke can conjure up extreme emotions on stage, but in real life she is even-tempered, almost reticent. In spite of the uniformly excellent reviews for almost every role she has tackled, she is reluctant to push herself forward and relies on her agent to set up engagements in international houses. "I don’t like to sell myself. I’d love to work on every stage in Europe, but I’m not the sort of person who says to a director, 'Please give me a part'." She has a thriving career, mostly in Europe, where her strongest relationships are with opera houses in Munich, Berlin and Vienna. She has worked in America – she made a very successful Metropolitan Opera debut in 2005 as the Marschallin – but she prefers to work within reach of Hamburg, where she lives with her husband, American tenor David Kuebler. They met in Christoph Marthaler’s 1998 production of Katya Kabanova in Salzburg, as Denoke remembers. "He was my lover, Boris. At one point in the music the director asked us to look into each other’s eyes, and at that moment something went between us. You can see it on the DVD!" They still perform in productions together but Kuebler is scaling down after a career of nearly 40 years and is happy to travel with his wife, or fly in for the weekend when she’s working away. Denoke is back on the stage of the Royal Opera House from 31 May in Salome, once more absorbing David McVicar’s vision and turning it into a riveting and doubtless harrowing experience. Don’t miss it. This piece was adapted from the piece published in the January 2010 issue of About the House, the magazine received by the Friends of Covent Garden. Find out how to become a Friend.